Coronary chronic total occlusions (CTOs) are defined as 100% occlusions with TIMI (thrombolysis in myocardial infarction) 0 flow for at least 3 months.1 Treatment options include diet and lifestyle changes, medication optimization, percutaneous coronary intervention (PCI), or coronary artery bypass grafting (CABG). Many CTOs are not approached for revascularization due to technical limitations and concern for complications, along with the mistaken notion that “good collaterals” mitigate ischemia. Despite technical challenges and associated complications, dedicated operators at several centers have revolutionized CTO-PCI techniques and have made revascularization possible in patients who otherwise have limited options. Although recent data have yielded clarity in the field of CTO-PCI, areas of controversy remain, which will only be resolved by more experience and new data. Data by Valenti and colleagues showed that successful CTO-PCI and improvement in survival are driven by differences in outcomes in patients with multivessel disease who achieved complete revascularization.10 The SYNTAX score has been shown to be predictive of procedural failure, and a higher SYNTAX score may be associated with increased risk of adverse cardiovascular outcomes. The residual SYNTAX score is a measure of the extent of remaining coronary disease after PCI and is thus a measure of complete revascularization. Several studies have suggested increased adverse outcomes and mortality in patients with a high residual SYNTAX score.8,11,12 The presence of a CTO has been shown to be the main driver of high residual SYNTAX scores, making CTO-PCI essential for complete revascularization, reduction in residual SYNTAX score, and potential improvement in outcomes. Figure 1. The hybrid algorithm. Adapted from Brilakis ES, Grantham JA, Rinfret S, et al. A percutaneous treatment algorithm for crossing coronary chronic total occlusions. JACC Cardiovasc Interv. 2012;5:367-379. Although technical approaches continue to improve, it is clear that dedicated CTO operators are driving this field forward. Currently, a hybrid approach is recommended when undertaking CTO-PCI, as it emphasizes flexibility in addressing the CTO at the onset and during the procedure (Figure 1).13 The most common reason for CTO-PCI failure is the inability to cross a lesion with a guidewire. 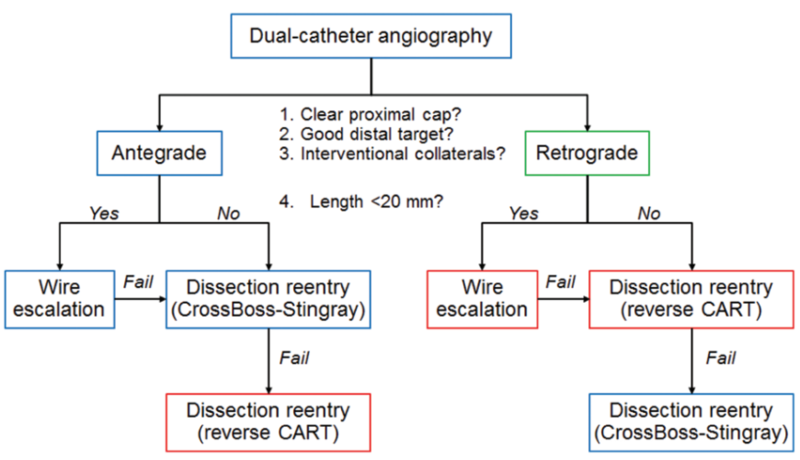 Three main strategies for lesion crossing include antegrade wire escalation, antegrade dissection/reentry, and retrograde wire crossing/reverse controlled antegrade and retrograde subintimal tracking (CART). The CTO operator must first perform high-quality dual coronary angiography to understand the proximal and distal vessel, visualize collateral circulation, and plan the approach. The angiographic images should be reviewed in detail to assess for the presence of a clear-cut or ambiguous proximal cap, length of the occlusion, location and size of collaterals that may be used for a retrograde CTO approach, vessel size distal to the CTO, calcium, and presence of bifurcations. The length of the CTO can help determine the best mode of crossing. Antegrade crossing is recommended as the first strategy for short CTO lesions < 20 mm. Long CTO lesions measuring ≥ 20 mm can generally be crossed more efficiently using antegrade dissection/reentry. Retrograde CTO-PCI can either be used as an initial means of crossing long lesions or after antegrade wire escalation or dissection/reentry methods fail. This approach involves advancing a guidewire via coronary collaterals into the distal true lumen and finally the proximal true lumen by retrograde wire manipulation. “True to true” lumen retrograde crossing is infrequent; thus, reverse CART is essential with this approach. Although every CTO is different, understanding and appropriate use of this hybrid algorithm are essential for operators. The Asia Pacific CTO Club has modified the United States–originated hybrid algorithm and suggests intravascular ultrasound–guided wiring and parallel wiring, likely secondary to the inherent technical skills and device availability of the region. Several additional algorithms may also prove useful to the CTO operator, including recommendations to increase guide catheter support, use of guide extensions and anchoring techniques, and frequent atheroablation for patients with balloon uncrossable/undilatable CTOs. The hybrid algorithm has been validated in several registries with consistent success of 85% to 90%.14-16 With increased numbers of operators using the hybrid approach, RCTs may be feasible in the future to help further elucidate the best techniques for CTO-PCI to optimize success rates and reduce complications. CTO-PCI may be associated with significant complications and hence should be undertaken by experienced and specifically trained interventionalists. Skill in managing complications such as perforation is very important for the CTO operator. Generally, higher-volume centers tend to have increased procedural success and fewer complications. In the 12-center OPEN-CTO PCI prospective registry of consecutive patients undergoing hybrid CTO-PCI, the technical success rate was 86% with an in-hospital death rate of 0.9%. Perforation occurred in 8.8%, periprocedural MI in 2.6%, acute kidney injury in 0.8%, and major bleeding in 0.3%.4 Additionally, it is important to note the 2% mortality associated with retrograde approach in this study. Figure 2. J-CTO score. Adapted from Morino Y, Abe M, Morimoto T, et al. Predicting successful guidewire crossing through chronic total occlusion of native coronary lesions within 30 minutes: the J-CTO (Multicenter CTO Registry in Japan) score as a difficulty grading and time assessment tool. JACC Cardiovasc Interv. 2011;4:213-221. Figure 3. PROGRESS CTO score. Adapted from Danek BA, Karatasakis A, Karmpaliotis D, et al. Development and validation of a scoring system for predicting periprocedural complications during percutaneous coronary interventions of chronic total occlusions: the Prospective Global Registry for the Study of Chronic Total Occlusion Intervention (PROGRESS CTO) complications score. J Am Heart Assoc. 2016;5:e004272. 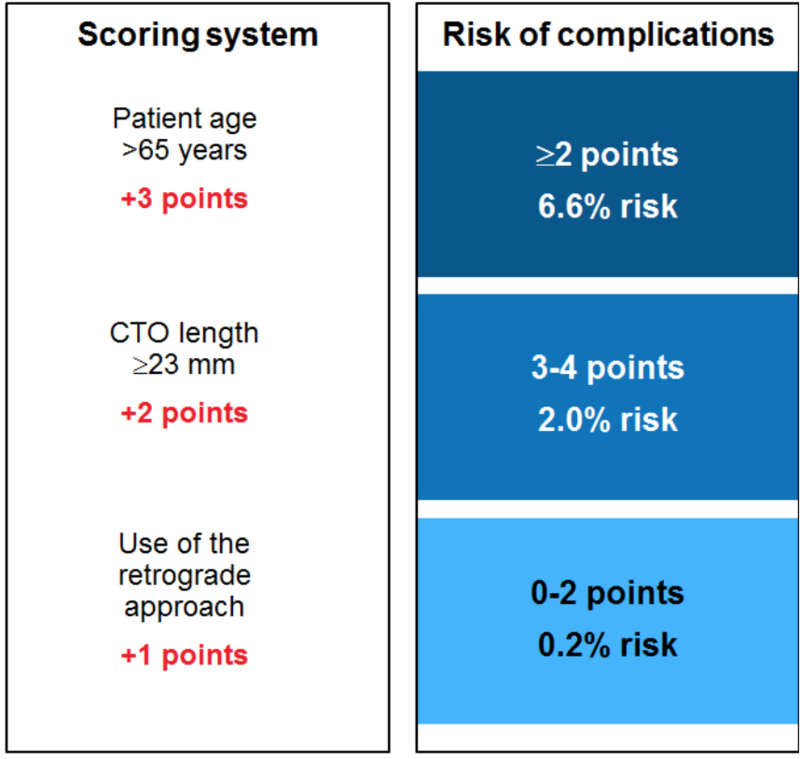 Additionally, the PROGRESS CTO score was developed to predict the risk of periprocedural complications after CTO-PCI (Figure 3). Danek et al found that this three-part score was predictive of procedural complications.20 Thus, appropriate patient selection is a key component to successful CTO-PCI, and special attention should be paid to this when determining whether to attempt revascularization of a CTO. 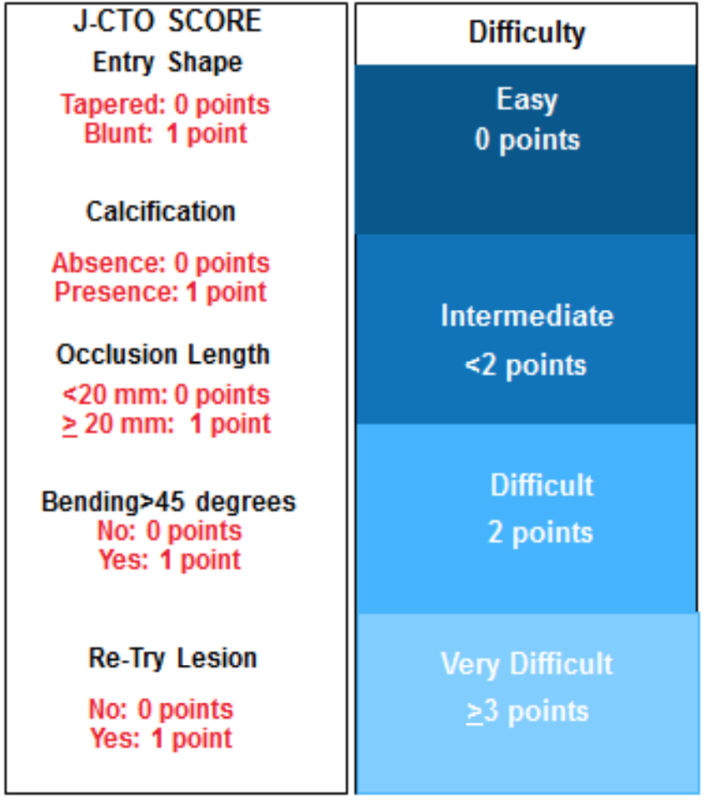 Scores such as the J-CTO and the PROGRESS CTO scores can aid in patient selection with the goal of optimizing outcomes. To optimize success and appropriately manage complications, it is imperative that the CTO operator is comfortable with and has access to basic equipment commonly used to approach a CTO. In addition to non–CTO-specific tools including sheaths, guidewires, balloons, and stents, the operators will also use guideliners for increased support, snares, rotablation, laser atherectomy, and perforation gear. Additionally, there are several tools specific to CTOs that operators should have in their toolkit. A variety of guidewires can be helpful in crossing a chronic lesion, including the Asahi family of wires, penetrating wires, nontapered and tapered wires, hydrophilic tapered and nontapered wires, the Stingray wire (Boston Scientific Corporation), “collateral crossing” wires, and externalization wires. The Hi-Torque Pilot 200 guidewire (Abbott Vascular) is a useful workhorse wire because it is stiff, nontapered, and advances across the path of least resistance, crossing through microchannels, if available, or into the subintimal space in a calcific CTO without microchannels. It will rarely exit unless it is in a side branch. The Asahi Confianza Pro 12 (Abbott Vascular), a stiff tapered wire, may be useful when approaching a CTO with a thick, hard, fibrous calcified cap. There are a variety of similar wires from other manufacturers as well. The Asahi Gaia family of wires (Abbott Vascular) was purpose-built for CTOs and allows precise manipulation through the CTO when used with a support catheter. Tapered hydrophilic wires are useful for microchannel exploration and knuckle wiring. Soft, lubricious, torqueable wires are best for collateral crossing. Externalization wires such as the Asahi RG3 (Asahi Intecc Co Ltd.) and R350 guidewires (Teleflex) are of sufficient length for externalization as well as kink resistant with a hydrophilic coating, facilitating externalization after successful retrograde crossing into the antegrade guide catheter. Although there is an increasing number of well-designed wires, it is important for an operator to choose favorites in each subcategory and be well acquainted with their characteristics. CTO operators will also need a variety of microcatheters at their disposal. The Asahi Corsair (Asahi Intecc Co Ltd.) can be used for antegrade or retrograde support, depending on the device size, and its tapered distal tip and ability to spin make it a particularly useful tool when approaching chronic lesions. The spiral turnpike catheter allows increased stability during knuckling in resistant lesions, because it has an outer coil on the distal shaft for added rotational advancement. There is a wide and increasing selection in this area, and operators should experiment and choose those they feel are the most predictable in their hands. Finally, specific tools designed for antegrade dissection/reentry such as the CrossBoss catheter, Stingray balloon, and Stingray wire (all Boston Scientific Corporation) should be available to the CTO operator to be used in conjunction with the hybrid algorithm to achieve maximal success. Additionally, the CTO toolkit should include equipment to efficiently and safely manage complications (eg, perforation), including stent grafts, coils, thrombin, a pericardiocentesis kit, and an echocardiography team. Continued technologic advancement in the CTO toolkit will continue to help CTO operators safely and successfully approach chronic lesions. Figure 4. DECISION CTO as-treated analyses. CI, confidence interval; HR, hazard ratio; OMT, optimal medical therapy. Adapted with permission from Dr. Seung-Jung Park, MD, PhD. The DECISION CTO study failed to show a difference in the 3-year rate of death, MI, stroke, or repeat revascularization in patients undergoing CTO-PCI. However, this study was limited by slow enrollment, which implies a very select low-risk population, subsequent early termination, limitations in trial design with multiple revisions of endpoints, and high rates of crossover between optimal medical therapy and CTO-PCI groups. Moreover, the difference in number of stents between both arms was minimal. 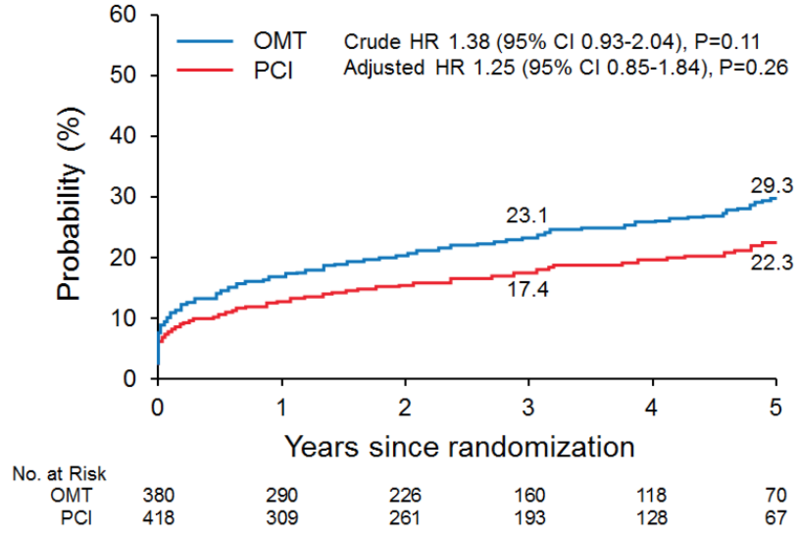 That being said, it is interesting that the as-treated analyses showed a trend toward a reduction in the primary endpoint of death, MI, stroke, and repeat revascularization with CTO-PCI, suggesting a potential benefit (Figure 4). Given the limitations of the study design, interpretation and application of these results are difficult. The ongoing SHINE-CTO trial (NCT02784418), which will randomize 142 patients to CTO-PCI versus sham with a primary endpoint of disease-specific health status as assessed by the Seattle Angina Questionnaire, may help further elucidate the benefits of CTO-PCI. The EXPLORE study assessed patients who had a concomitant CTO and ST-segment elevation MI. Although no difference was found in global left ventricular (LV) function, a subanalysis suggested an improvement in regional function in patients undergoing CTO-PCI of the left anterior descending artery. This may imply greater potential benefit for CTO revascularization in patients presenting with an acute MI. There continues to be controversy as to whether LV function improves after successful CTO-PCI. Sotomi et al found that even in the absence of LV ejection fraction improvement, regional longitudinal strain improved on two-dimensional speckle tracking echocardiography.22 The REVASC trial reported that CTO-PCI did not improve LV function but did improve symptoms in patients after CTO-PCI. In patients with low ejection fraction, CTO-PCI may improve ejection fraction, as reported by Galassi and colleagues.23 Thus, controversy remains regarding the role of CTO-PCI in improving LV function, but at this time, improvement in QOL and symptoms is the primary goal when performing CTO-PCI. Some controversy exists regarding the most appropriate access site when performing CTO-PCI. Ultimately, this is often operator preference. Although most operators use bilateral 8-F femoral sheaths, some operators use a combination of both radial access sites or radial and femoral access with the liberal use of guide extension. Recent studies have reported high success rates with use of radial access in selected patients.24,25 Overall, this is often operator dependent and based on angiographic review. Although further investigation in the form of RCTs may better answer certain areas of controversy, there is a large body of evidence supporting CTO-PCI for appropriately selected patients. The improved QOL patients experience with CTO-PCI justifies the potentially increased risk of complications. When looking to start a CTO program, it is important that it is built around dedicated CTO operators performing CTO-PCI on designated days and never on an ad hoc basis. CTO operators should take advantage of the growing number of CTO courses and seek proctoring opportunities. Additionally, it is best that CTO operators work in pairs, especially in the early stages. The development of the hybrid algorithm has helped CTO operators systematically approach a chronically occluded lesion. Further modifications such as the use of intravascular ultrasound–guided wiring and parallel wiring may continue to help operators successfully, safely, and efficiently cross CTOs. Regardless, skill in managing associated complications is imperative for the CTO operator, as is selecting appropriate patients. With the development of scores such as J-CTO and PROGRESS CTO, operators can select the optimal patients and reliably predict the likelihood of success and complications. Controversy surrounding whether CTO-PCI is associated with improved LV function and ultimately mortality will only be cleared through continued investigation. Additional RCTs further exploring patient selection and CTO crossing technique, as well as validation of new scores with improving technology, may help operators as they continue to safely and successfully treat this complex patient population. 1. Tajti P, Brilakis ES. Chronic total occlusion percutaneous coronary intervention: evidence and controversies. J Am Heart Assoc. 2018;7:e006732. 2. Joyal D, Afilalo J, Rinfret S. Effectiveness of recanalization of chronic total occlusions: a systematic review and meta-analysis. Am Heart J. 2010;160:179-187. 3. Rossello X, Pujadas S, Serra A, et al. Assessment of inducible myocardial ischemia, quality of life, and functional status after successful percutaneous revascularization in patients with chronic total coronary occlusion. Am J Cardiol. 2016;117:720-726. 4. Sapontis J, Salisbury AC, Yeh RW, et al. Early procedural and health status outcomes after chronic total occlusion angioplasty: a report from the OPEN-CTO registry (outcomes, patient health status, and efficiency in chronic total occlusion hybrid procedures). JACC Cardiovasc Interv. 2017;10:1523-1534. 5. Bruckel JT, Jaffer FA, O’Brien C, et al. Angina severity, depression, and response to percutaneous revascularization in patients with chronic total occlusion of coronary arteries. J Invasive Cardiol. 2016;28:44-51. 6. Werner G. A randomized multicentre trial to evaluate the utilization of revascularization or optimal medical therapy for the treatment of chronic total coronary occlusions (EuroCTO). Presented at EuroPCR; May 16–19, 2017; Paris, France. 7. Park S. Drug-eluting stent implantation versus optimal medical treatment in patients with chronic total occlusion (DECISION-CTO). Presented at American College of Cardiology’s 66th Annual Scientific Sessions; March 17–19, 2017; Washington, DC. 8. Vetrovec GW. Chronic total occlusion PCI: is this the ultimate test of the importance of complete revascularization? JACC Cardiovasc Interv. 2016;9:539-540. 9. Bangalore S, Blecker S, Hannan EL. Everolimus-eluting stents or bypass surgery for coronary disease. N Engl J Med. 2015;373:582. 10. Valenti R, Migliorini A, Signorini U, et al. Impact of complete revascularization with percutaneous coronary intervention on survival in patients with at least one chronic total occlusion. Eur Heart J. 2008;29:2336-2342. 11. Jang WJ, Yang JH, Song YB, et al. Clinical implications of residual SYNTAX score after percutaneous coronary intervention in patients with chronic total occlusion and multivessel coronary artery disease: a comparison with coronary artery bypass grafting. EuroIntervention. 2017;13:97-105. 12. Farooq V, Serruys PW, Bourantas CV, et al. Quantification of incomplete revascularization and its association with five-year mortality in the synergy between percutaneous coronary intervention with taxus and cardiac surgery (SYNTAX) trial validation of the residual SYNTAX score. Circulation. 2013;128:141-151. 13. Michael TT, Mogabgab O, Fuh E, et al. Application of the “hybrid approach” to chronic total occlusion interventions: a detailed procedural analysis. J Interv Cardiol. 2014;27:36-43. 14. Basir MB, Karatasakis A, Alqarqaz M, et al. Further validation of the hybrid algorithm for CTO PCI; difficult lesions, same success. Cardiovasc Revasc Med. 2017;18:328-331. 15. Pershad A, Eddin M, Girotra S, et al. Validation and incremental value of the hybrid algorithm for CTO PCI. Catheter Cardiovasc Interv. 2014;84:654-659. 16. Maeremans J, Walsh S, Knaapen P, et al. The hybrid algorithm for treating chronic total occlusions in Europe: the RECHARGE registry. J Am Coll Cardiol. 2016;68:1958-1970. 17. Morino Y, Abe M, Morimoto T, et al. Predicting successful guidewire crossing through chronic total occlusion of native coronary lesions within 30 minutes: the J-CTO (Multicenter CTO Registry in Japan) score as a difficulty grading and time assessment tool. JACC Cardiovasc Interv. 2011;4:213-221. 18. Tanaka H, Morino Y, Abe M, et al. Impact of J-CTO score on procedural outcome and target lesion revascularisation after percutaneous coronary intervention for chronic total occlusion: a substudy of the J-CTO registry (Multicentre CTO Registry in Japan). EuroIntervention. 2016;11:981-988. 19. Syrseloudis D, Secco GG, Barrero EA, et al. Increase in J-CTO lesion complexity score explains the disparity between recanalisation success and evolution of chronic total occlusion strategies: insights from a single-centre 10-year experience. Heart. 2013;99:474-479. 20. Danek BA, Karatasakis A, Karmpaliotis D, et al. Development and validation of a scoring system for predicting periprocedural complications during percutaneous coronary interventions of chronic total occlusions: the Prospective Global Registry for the Study of Chronic Total Occlusion Intervention (PROGRESS CTO) complications score. J Am Heart Assoc. 2016;5:e004272. 21. Henriques JP, Hoebers LP, Ramunddal T, et al. Percutaneous intervention for concurrent chronic total occlusions in patients with STEMI: the EXPLORE trial. J Am Coll Cardiol. 2016;68:1622-1632. 22. Sotomi Y, Okamura A, Iwakura K, et al. Impact of revascularization of coronary chronic total occlusion on left ventricular function and electrical stability: analysis by speckle tracking echocardiography and signal-averaged electrocardiogram. Int J Cardiovasc Imaging. 2017;33:815-823. 23. Galassi AR, Boukhris M, Toma A, et al. Percutaneous coronary intervention of chronic total occlusions in patients with low left ventricular ejection fraction. JACC Cardiovasc Interv. 2017;10:2158-2170. 24. Tanaka Y, Moriyama N, Ochiai T, et al. Transradial coronary interventions for complex chronic total occlusions. JACC Cardiovasc Interv. 2017;10:235-243. 25. Murakami T, Masuda N, Torii S, et al. The efficacy and feasibility of chronic total occlusion by transradial intervention: a Japanese single-center retrospective study. J Invasive Cardiol. 2015;27:E177-181.